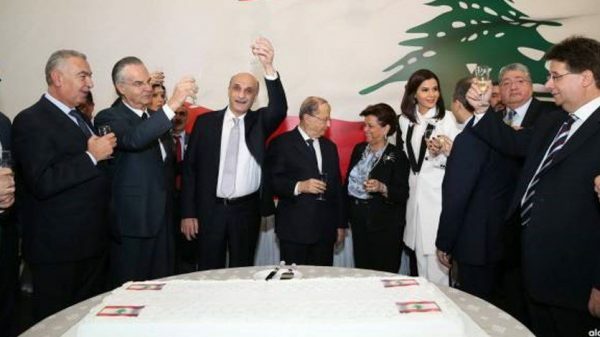 “The Lebanese Forces and the Free Patriotic Movement promised Christians that they would lead them into a new era of effective political presence and role, but what has been made public is a mere deal aimed at splitting ministerial, parliamentary and administrative posts and distributing them to partisans and supporters,” the sources told al-Joumhouria newspaper in remarks published Saturday. “Where are the national principles in the agreement, which contained no common vision for regaining sovereignty, reviving the role of legitimate institutions or implementing the constitution?” the sources asked. “A bilateral agreement between two parties cannot abolish the constitution, especially in terms of equality among citizens regarding rights and duties… Administrative posts should not be limited to those chosen by political parties, whoever these parties might be,” the sources went on to say. 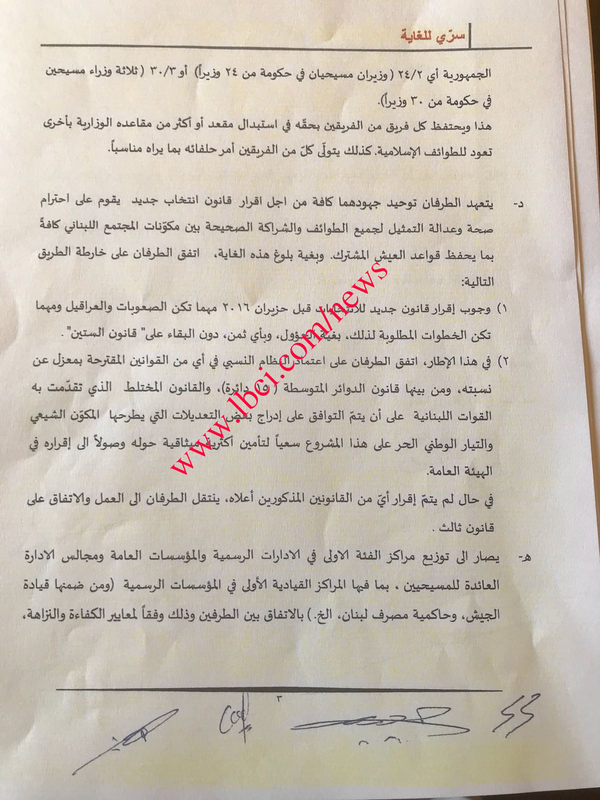 The LF reportedly leaked the highly confidential agreement to the media in recent days after FPM chief Gebran Bassil reneged on implementing the deal as far as the share that each of them should get in the new government. 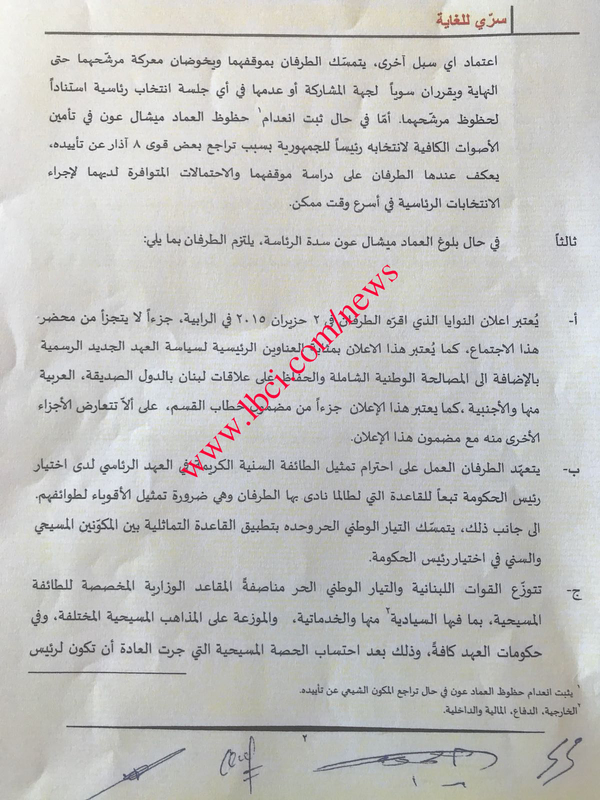 “Their agreement is a Christian Sykes-Picot aimed at splitting gains between the FPM and the LF and attempting to impose what resembles a ‘political mandate’ on the Christian arena,” the Marada official told ad-Diyar . The Sykes-Picot Agreement was a secret 1916 agreement between Britain and France under which the two world powers agreed to divide Ottoman-held Lebanon, Syria, Iraq and Palestine into various French- and British-administered areas. “They are trying to monopolize the Christian arena and prevent the emergence of a significant bloc that opposes them,” he added. “This exclusionary scheme will not be allowed to happen and it will be confronted,” the Marada official vowed. 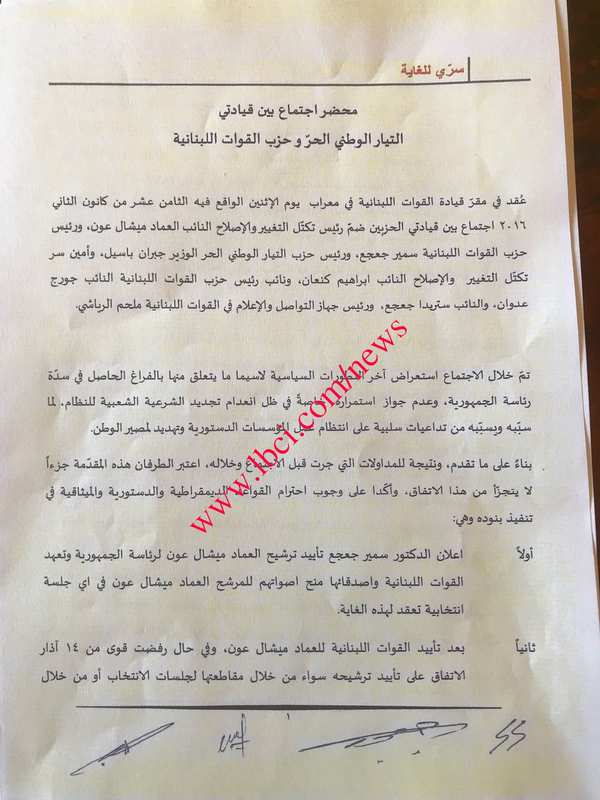 LBCI obtained a full copy of the accord. 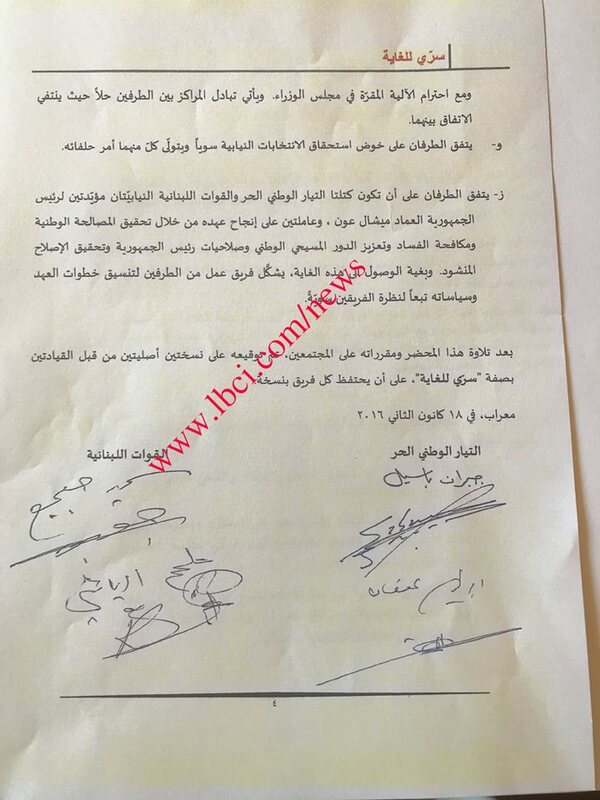 The four page accord begins with a declaration of intent between the two parties and ends with the signatures of Free Patriotic Movement head Gebran Bassil and MP Ibrahim Kanaan representing FPM and the signatures of Lebanese Forces leader Samir Geagea and Minister of InformationMelhem Riachi representing LF . The agreement tackled the parliamentary elections, the distribution of the ministerial portfolios between the two parties and the distribution of top government posts.